On the morning of a new Congressional hearing led by popular congressman Stephen Collins (Ben Affleck) the lead Research Assistant falls in front of a train on her way to the hearings. 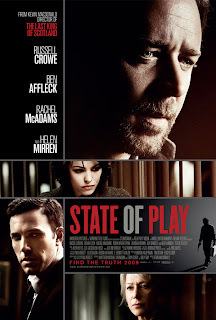 Old style news reporter for the Washington Globe Cal McAffrey (Russell Crowe), investigating a shooting of a petty thief thinks there may be a connection because his seasoned hunches as a reporter just tell him so. (McAdams), a colleague of Cal, discovers that Sonia's death occurred in one of only three CCTV blind spots on the metro platform. Cal believes the shootings are related to Sonia's death and finds a link between the thief and a homeless girl who sought out Cal. She gives him photographs that the thief, a friend of hers, stole from the killer's briefcase. The photos show surveillance images of Sonia talking to a well-dressed man. Della visits the hospital where the pizza delivery man is regaining consciousness. She bumps into a man while exiting an elevator. She sees the pizza man in his hospital bed shot dead by an unseen sniper. Distraught, she returns to her newspaper's office and reviews CCTV footage; she recognises the man she bumped into at the hospital on the footage from the metro platform and at the elevator in the hospital. Cal asks a connection he has inside PointCorp to find information regarding the man. He reveals that PointCorp stands to gain $40 billion annually from its mercenary activities in the Middle East and domestically. Cal speaks with Collins, who shares his research findingsPointCorp is cooperating with other defense contractors to create a monopoly and purchase Government surveillance and defense contracts, essentially privatizing United States security. Cal's PointCorp insider returns with the address of someone linked to the suspected assassin. Cal visits the address to find the assassin living there. Terrified, Cal makes an excuse and tries to leave. Stalked by the man, Cal calls the police who arrive and force the man to disappear after he shoots at Cal. authorization from him. Cal goes to his car where he is confronted by Bingham, who says he will kill for a friend. Cal ducks, and federal officers shoot Bingham before he opens fire. At the office, Cal and Della type up their story and depart together. The film credits roll with footage of the newspaper being printed.